← No post today due to moving insanity. Cranberries and pumpkins seeds in baked pita. Why not? Trader Joe’s Pita Crisps with Cranberries and Pumpkin Seeds are a fine, crispy cracker, though it’s applications are limited. 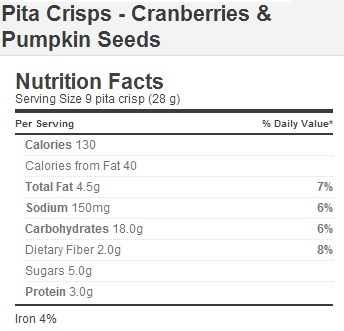 More interesting, I’d say, is that they decided to put pumpkin in a pita chip at all. And I’m pretty sure this is only a partial list. I swear to you I didn’t make any of this up – not even “pumpkin trees”, a phrase which you’d be entirely justified in using as an excuse to write off this blog as surreal and joke-prone if it weren’t actually, really a thing they really have. Pumpkin dog treats? Pumpkin greek yogurt!?!? These people are goddamn crazy. This is not the output of a sane company. No one needs this many pumpkin products for fall – in fact, no one needs this many pumpkin products over the course of their entire lifespan. Somebody get in there and restrain these lunatics. I’m not joking, someone is in serious need of restraint and possibly anti-psychotics. Somewhere in the upper offices of Trader Joe’s Monrovia enclave an executive is stomping around, frothing at the mouth, demanding more and more pumpkin dishes, occasionally bursting into the R&D department and executing employees for not thinking “pumpkin” enough. I wish I could think of an alternative scenario that would explain this level of pumpkin output, but I really can’t. I can only imagine the chaos overtaking the Trader Joe’s processing facilities. Huge dump trucks full of pumpkins backed up down the road, honking at each other so they too can send their load tumbling into the giant pumpkin hopper, itself already clogged with huge, bright orange pumpkins as the special, industrial pumpkin masher below, a specialty unit flown in from Germany, overheats under the strain of too many pumpkins. 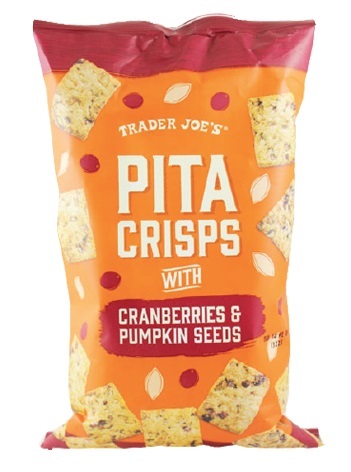 Which brings us to the first entry on the ludicrous list of Trader Joe’s pumpkin products – Trader Joe’s Pita Crisps and Pumpkin Seeds. I’ll be hitting as many of these items as possible before the end of pumpkin season and, arbitrarily, I’ve chosen to start here. Keep an eye on the pumpkin list though – I’ll update it with links to articles as I go. These really are excellent crackers. Case in point, they’re made with whole wheat and whole seeds, they’re toasted to a crispy brown, and they’re made by a small family owned bakery in Canada. That’s a very nice pedigree. The pita crisps find a very nice little spot between sweet and salty. The saltiness (sea salt) is quite slight, just enough to grace the tongue and heighten the sweetness (organic cane sugar and the sweetened cranberries). Neither is so strong that it detracts from the earthy, whole grain taste of the toasted wheat and roasted pumpkin. The fact is, I’d probably have preferred the crackers more it they didn’t have the cranberries at all. It’s an excellent snacking cracker in and of itself, thick, with a nice snap and good crunch that isn’t too dry. The cranberry bits are fine, they lend a slight chewiness to each cracker in addition to their sweetness, but they also infuse it with a berry flavor that fights a lot of other foods. This means that you’re limited as to what you can eat these pita crisps with. Most cheeses are just fine, especially Trader Joe’s fruity goat cheeses, but that’s about it. However most dips, particularly hummus and salsa, clash with the berry taste, which really curtails their table top use. As compliments to cheeses or eaten by themselves the crackers are very nice – they’re just going to have a hard time rising out of the novelty, holiday food niche. Would I Recommend Them: Yes, if you’re planning ahead to a nice cheese plate. Would I Buy Them Again: Good though they are, I’ll be buying less specialized crackers in the future. Final Synopsis: A very, very good cracker, but a bit too sweet to go with many foods.